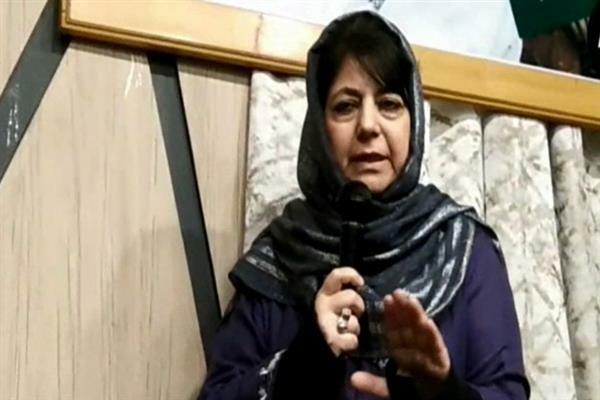 Srinagar, Jan 21 (KNS): Peoples Democratic Party (PDP) chief and former Jammu and Kashmir Chief Minister Mehbooba Mufti on Monday said the encounters can’t be stopped in Kashmir till there is a conflict and presence of militants. As per Kashmir News Service (KNS), she said those who talk about stopping encounters should know that they appreciated those police officers who were involved in fake encounters. “Farooq Abdullah appreciated the SSP who was behind Pathribal Fake Encounter. He showered praises for him in Assembly. During Omar's time numerous encounters happened. No one can stop encounters,” she said while addressing party workers in a convention at her Gupkar residence. Mehbooba said their alliance with BJP was based on a well drafted Agenda of Alliance.